While Waterford is a pioneer in design, sometimes the most simple patterns remain the most popular. Thats certainly the case with the Classic Collection, which features a timeless frame recognizable in style to all. 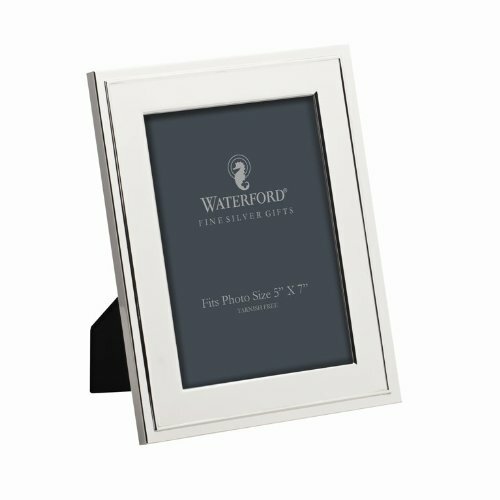 The 5-inch by 7-inch Silver Frame borders your cherished photos with gleaming silver. For all metals giftware, including sterling silver, silver-plated, nickel-plated and alternative metals, we recommend hand washing. Giftware should be hand washed with a mild detergent. Do not use lemon-scented detergents. Do not use abrasive cleaners that can scratch and dull metal surface. Be diligent in rinsing items as soon as possible that may have come in contact with some foods such as eggs, mayonnaise, vinegar, lemon juice, etc. Do not let it soak for long periods of time in water. After using sterling giftware, rinse as soon as possible. Use a soft cloth to dry each piece thoroughly. Make sure each piece is completely dry before storing.